A seminal effort in the “spooky kid” genre, 1960’s Village of the Damned takes us to the rural English town of Midwich. In this quaint locale, an unexplained event knocks all the residents and animals unconscious. Led by Major Alan Bernard (Michael Gwynn), authorities investigate this bizarre occurrence, but eventually all those affected wake up on their own – except for a few who died in accidents connected to their lack of consciousness. Otherwise, life appears to return to normal – until it turns out that a slew of Midwich women became pregnant on the day of the “blackout”. Nine months hence, the women go into labor at the same time and produce nearly identical children. Along with Major Bernard, local professor Gordon Zellaby (George Sanders) keeps tabs on the children – including Zellaby’s son David, one of these kids. This becomes more complicated as it turns out that these youngsters – all of whom have the same odd ultra-pale hair – seem less than normal. Due to Blu-ray release dates, I came to the 1960 Village about two years after I viewed its 1995 remake. Even with John Carpenter involved, the latter largely flopped as a creative endeavor. However, I thought the basic story demonstrated room to succeed. As such, I found myself intrigued to give the original Village a look and see if it exploited the material in a more satisfying manner than its remake. Without question, it does. Although I’m not sure I view the 1960 Village as a great film, it manages to provide a pretty creepy and clever experience. On the negative side, Village clearly came with a restricted budget, and the lack of money shows, especially in terms of visual effects. Almost every shot of the children’s glowing eyes uses a still photo, and a scene in which a house catches fire delivers a model so obvious that it’d fit in an Ed Wood movie. Village doesn’t rely on effects much, though, so these lapses become forgivable. The movie focuses on characters and narrative to generate its drama, and it fares nicely in that regard. Unlike the 1995 remake, the 1960 film gives us a logical progression of events. Whereas no one seemed all that surprised/befuddled by the kids’ obvious abnormalities in the 90s version, the 1960 take’s locals show sensible levels of concern, and matters follow a path that feels right. The movie manages to allow the kids to develop in a gradual way, so while it sets them up as unusual and potentially malevolent, it doesn’t rush into these topics. Instead, it lets matters progress in a way that draws in the viewer. We may know the children will turn into a powerful threat, but we get this information at the same time as Zellaby and the others. The absence of telegraphed information allows the menace to feel more natural and chilling. Though more famous for aloof, arrogant roles, Sanders handles the “heroic lead” well. He creates a pretty rich character via Zellaby, one whose inner conflicts come out well. Sanders turns Zellaby into a more three-dimensional main character than we’d expect from a film like this. Understated and well-developed, Village of the Damned creates a mostly effective horror film. Though I don’t know if it becomes a true classic, it fares nicely and keeps us with it. 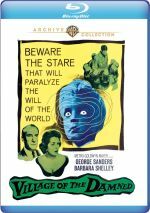 Village of the Damned appears in an aspect ratio of approximately 1.78:1 on this Blu-ray Disc. This turned into a satisfying image. Blacks came across as deep and tight, and contrast was a strength. Low-light shots demonstrated nice clarity and dimensionality. All of this added up to a pretty strong presentation. For its era, the movie’s DTS-HD MA monaural soundtrack worked fine, and dialogue sounded clear and acceptably natural. In a manner typical for the era, speech seemed a little thin at times, but I detected no concerns related to intelligibility or edginess. Effects were also clear and decently realistic, and they lacked problems related to distortion. I heard no concerns related to background noise or source flaws. Overall, the soundtrack to Village served the movie in a more than adequate manner. In addition to the movie’s trailer, we find an audio commentary from film historian Steve Haberman. He provides a running, screen-specific look at the source novel and its adaptation, story/characters, cast and crew, music, editing, cinematography and other topics. Haberman starts out well and makes this a good chat for roughly the movie’s first act. However, he then largely runs out of steam. This means the rest of the track tends toward basic narration or dead space. We still get some insights, but the discussion tends to drag too much, and this makes it mediocre after a solid opening. One of the more famous films to focus on “evil children”, 1960’s Village of the Damned overcomes some budget-related flaws to turn into an effective thriller. With a good cast and a nicely understated approach to its chills, the movie delivers a compelling tale. The Blu-ray brings very nice picture along with acceptable audio and an erratic commentary. Village holds up after nearly 60 years.